Do you love the comfort and warmth of carpet, but appreciate the enviable, timeless appeal of hardwood flooring? Get the best of both by adding an extra dimension to your interior design. If you’ve got hardwood floors, an area rug from Harris Flooring America is an ideal home addition. Some homeowners feel that area rugs serve to cover up the beautiful flooring you’ve invested in. However, all it takes is a bit of inspiration to improve your existing décor by accentuating the foundation of your interior with another layer. 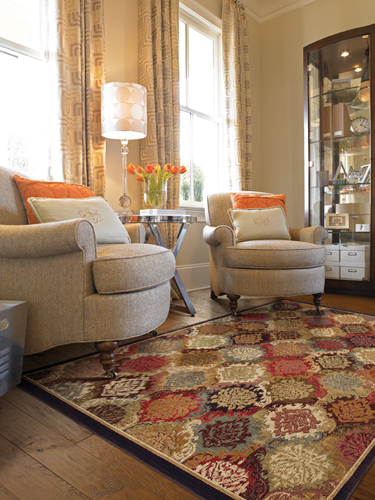 Bring every element of your space together with one of our luxurious area rugs in Anderson, SC. At our flooring showroom, we proudly feature a vast selection of custom area rugs and carpet runners that are sure to fit any budget or décor. From machine-made rugs to our premium handcrafted choices, shoppers of every preference are sure to find an exceptional selection in our collection. No matter what design or style you have in mind, we’ll help you find the perfect rug to satisfy your unique tastes. An area rug is designed to cover the majority of the floor space within any given room of your home. It can be used for everything from making bold statements to reducing room noise and protecting the floor underneath, making it equally attractive and functional. Visit our fully stocked area rug store to discover all of the beautiful choices that are waiting for you. Best of all, under the Flooring America banner, you can rest assured that you’re getting high-end flooring products at a fraction of their retail price. Should you have any questions regarding our products, our knowledgeable specialists are eager to answer any questions you may have and will help you find a selection that’s a perfect fit for your space. Runner rugs are lovely rectangular shaped rugs that usually placed in narrow spaces such as in doorways, and on or near staircases. These beautiful home additions allow you to dress up your space while also helping to prevent floor damage in spaces that see a great deal of foot traffic. Practical, gorgeous, and easy to care for, a custom carpet runner from our store is an ideal protective element that you can add to your floor to preserve its appeal for years to come. With options from some of the industry’s most trusted brands, we can help you complement any room in your home with one of our distinctive flooring solutions and give your space a look and feel that’s all its own. Shop us today to get started on finding the perfect flooring for your property. Contact us for more information about our luxurious area rugs and carpeting options. We proudly serve customers in Anderson, Seneca, Greenville, Clemson, and Easley, South Carolina, as well as the surrounding areas.